Parameswaran Subramaniyam continued his fast unto death undettered for the 19th day Saturday placing five demands including an immediate stop of the inhuman killings of innocent Tamils in Vanni by Sri Lanka armed forces, sources in London said. “I will be happy to lay down my life for the sake of Tamil people,” Parameswaran said. His tent flaps remained closed Saturday due to foul weather and hundreds of people were seen waiting patiently in a long queue to convey their wishes and support to Parameswaran. The protest demonstration against the relentless attacks on the Tamils in Vanni observed for the 20th day Saturday had drawn media coverage in Britain and several countries of the world. ‘The South Korean Times’ media persons met Parameswaran and stood bearing placards with slogans against the genocide of the Tamils, in Parliament Square. 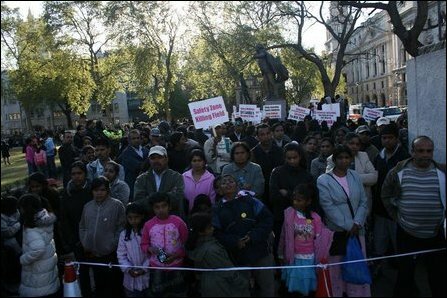 Hundreds of foreign nationals participated in the protest demonstration launched Saturday by the London branch of the International Committee against the Disappearance of Tamils in Trafalgar Square to draw the attention of the International Community to the continuing disappearance of Tamils in Sri Lanka. Tamil diaspora protestors also staged a protest in front of a Mark and Spencer establishment distributing handbills calling the boycott of Sri Lankan produces sold in the super market. The London Marathon Race that is to be held through Parliament Square Monday is expected to draw thousands of diaspora Tamils in their unceasing efforts to draw the attention of the world community to the genocide of Tamils in Sri Lanka. 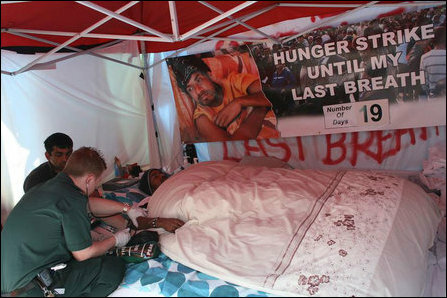 19.04.09 Diaspora youth hunger strike ignites mass struggle..